India and China, at 10th and 5th places drop down to 37th and 35th places when it comes to the weight of gold per capita! Clearly, we should buy more!! Lebanon and Libya are pricing in their geopolitical risk by paying rent and holding charges for all the massive horde of gold that they have given the size of their economy. Germany, France and Italy are very well placed. From where did they get all their gold, I wonder. So is there a trading play in Indian gold? I am not a goldbug enough to know. Goldbugs don’t know anyways. 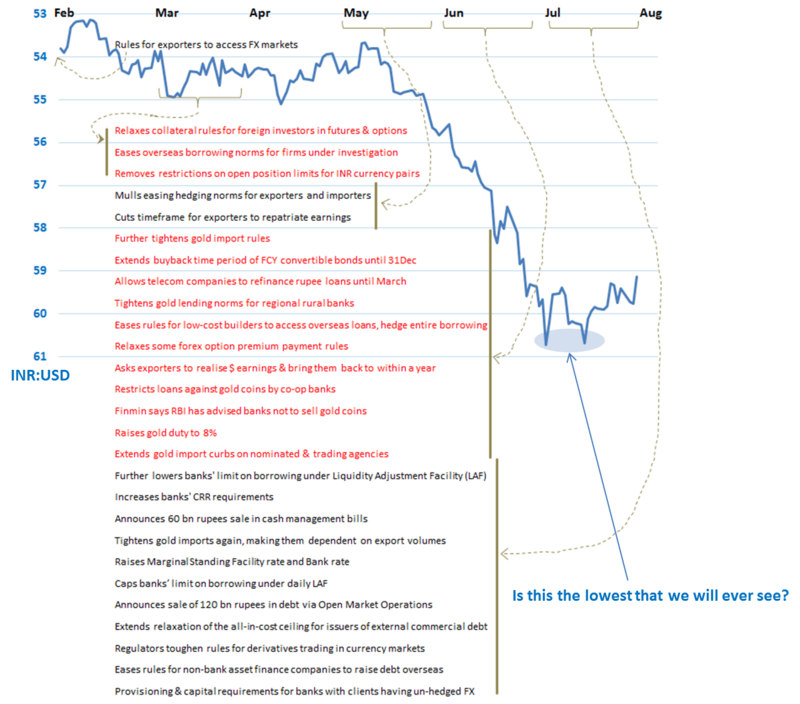 Maybe there is a 5% – 10% scope in gold in rupee terms that is possible now. Constant pressure on the rupee has kept the INR gold chart very subdued as compared to the USD price of gold. 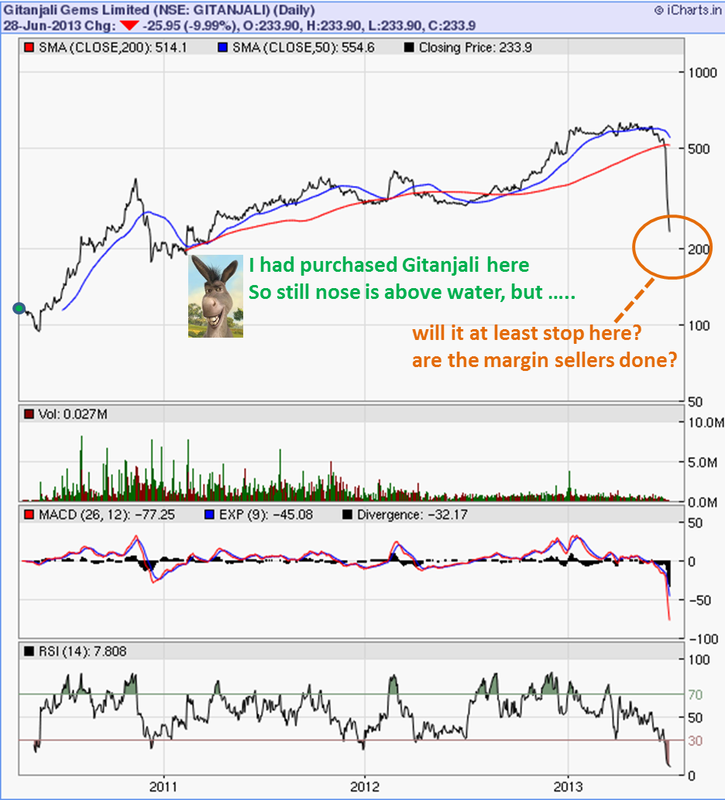 The first chart below shows the daily price chart of a local Indian gold ETF over the last 18 months – on the charts, it does not show a set-up which gets me excited. On the longer 3 year chart with weekly prices, there certainly seems room but again, the present price does not scream a buy (to me). That the markets may be getting ready to fall big this fall. All over the world stock markets are crashing. Even The Telegraph has started talking about doomsday and other apocalyptic messages. Do read the link if possible – has a lot of charts and explanations in a (hopefully) simple to understand manner. The Chinese devaluation of their currency was a shocker (in more ways than one). Not that I was long on the Remnimbi Yuan but some things happened. I had to down myself a couple of pegs even as our neighbours downed their currency a peg or two down. So I looked up the performance of some world equity indices and their corresponding currencies during the trailing twelve months to develop a personal view on what’s happening. 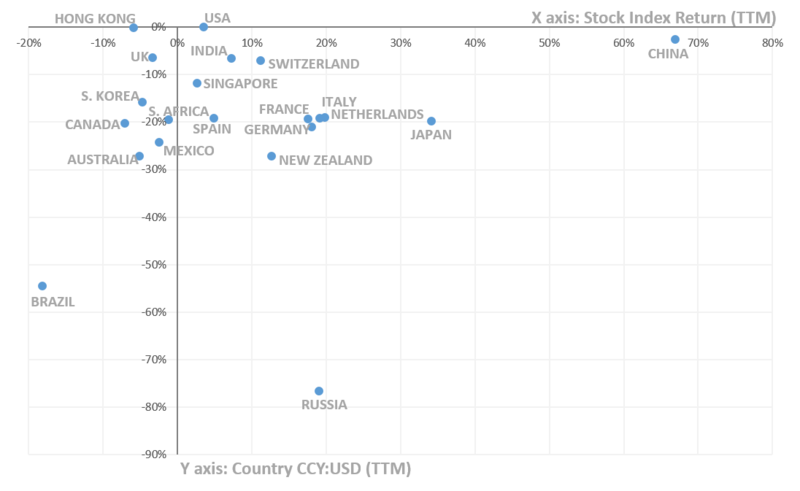 The chart below shows a scatter of the % change of a country’s representative stock index plotted against the corresponding % change in its national currency vs. the USD. A few outliers like Venezuela (stock market up 500%?) and Ukraine (equity down 27% and currency down 60%) were left out to bring the other data points into comparative focus. The worrisome point is that while we may not think much about a Ukraine being an outlier (due to relatively lower market cap) but then what would you say to a Russia with a currency devaluation of 77%? 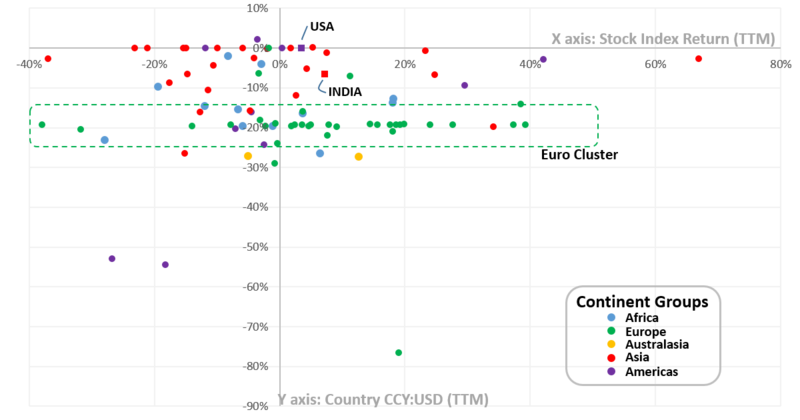 The other thing of note in the chart below is the bunching up of the green dots. They represent the various Eurozone countries, most of them falling in a common “y-band” due to the pegs that they have on the Euro. The question of entropy and equilibrium that I am asking is: How can a -40% to +40% range in equity returns sustain itself on a foundation of such a narrow difference between the movements of their respective national currencies. Doesn’t this portend to the Euro equilibrium going out of balance? While the above chart has data corresponding to 85 countries, the chart below shows the top 20 countries. Look at the golden quadrilateral formed by the points represented by the BRICS. Clearly each of the BRICs have followed unique paths to get where they are on this chart. Already fewer than 20% of Emerging Markets are trading above their 200 DMA levels (link, link). My hunch is that China will quickly begin moving towards the left on this chart. Smart Chinese money has already moved out of equity (link). My hunch is that China and Russia will move left the most. India will certainly move left but perhaps not to the extent that China will fall. That’s my hunch. I may be wrong, but I think soon enough a time will come when it will pay to be ready with your shopping bag. Hopefully the stock market will go ON SALE!!! Will the US market ever pause and think? It’s been rising continuously since 2009 with maybe 4 – 5 good sized corrections thrown in for the sake of good order. I think it’s important for its own sake that the market stops and gives us a nice juicy correction. No one for sure knows when it’ll happen, but a significant correction does look probable one day or the other (as probable as the death that awaits us!). 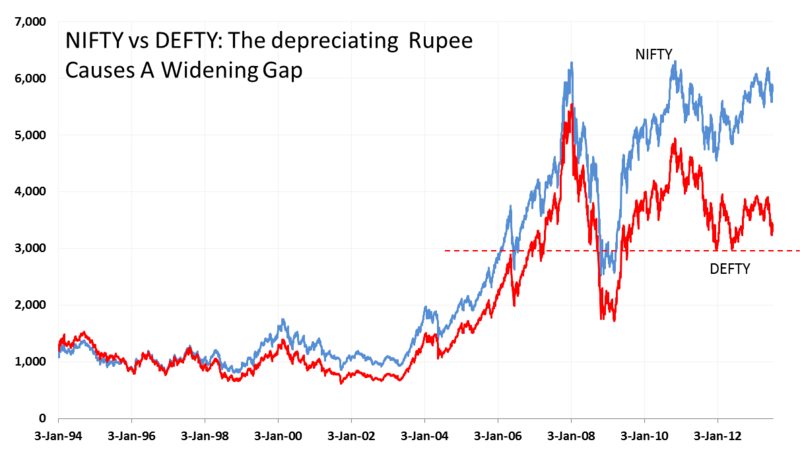 This seemingly parabolic rise (y = a * x^2) of the NASDAQ Composite since the past 4 years requires energy for sustenance – which we know has provided by the various strains of the QE program till now. 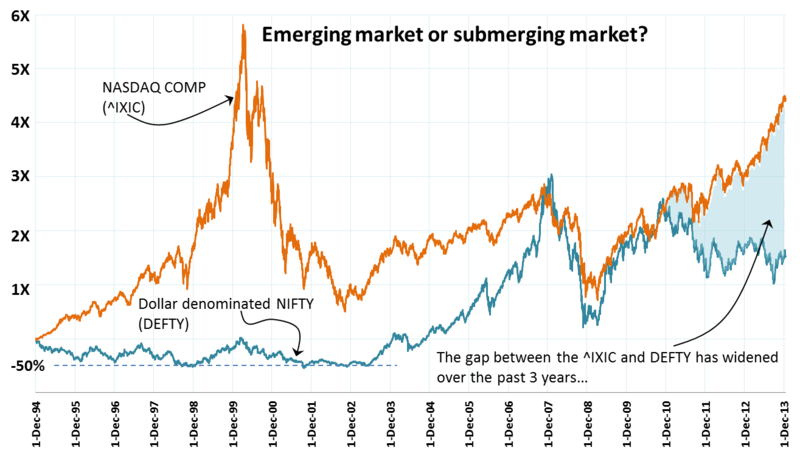 The second chart here is telling – it compares the rise of the NASDAQ composite with our desi NIFTY (the latter quoted in USD) – i.e. the DEFTY. It’s important to compare against the DEFTY since the fx related variances are removed. Stating the NIFTY in USD is also important to see the impact that the QE has had on the emerging submerging world. The QE has effectively ‘exported’ inflation to the emerging world. Here’s a link to an article that inter alia contains a beautiful chart on the QE program and explains how the QE now seems to be becoming quite the drag on the US GDP and long term rates than before. So is it a good idea to prepare for the inevitable and be in cash? Barry Ritholtz discusses a perplexing slice of affluent Americans’ wealth pie that’s worrying them: cash! Are they worried because there is a raging bull market in equities next street? Or are they worried because earnings of companies are increasing? Since when did that become a cause for worry? While I am not an affluent American by any stretch of imagination, this does apply in my case as well. 🙂 I am way too much in cash these days than what the doc prescribed. Yes, I know I am losing money by the minute and I am aware of things like fixed income and its ilk (fixed maturity plans, tax free bonds, etc.) but somehow I have not been able to move myself to lighten my burden. It’s like a sack of sand with a hole at the bottom. The burden does get lighter given the hole called inflation. I have even been called by the “relationship managers” of the bank I use and have been lectured on the demerits of keeping cash in the portfolio. To my credit, I listened patiently. But haven’t acted on the tip! 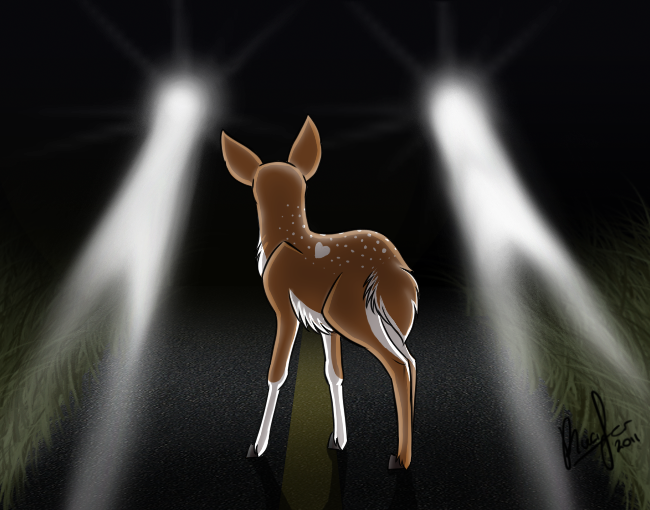 Is being a deer that’s stuck in the headlights a bad thing? I guess it is. Searching for an idea that could be a good use for the cash I have. Waiting for Godot, it seems I am. I read an article in The Financial Express of yesterday about the measues taken by the RBI and a couple of other agencies to halt the rupee’s decent and constructed the following infographic. What an u turn we have seen – of people of all manger of expertise who once extolled the decoupled state of Indian economy during the erstwhile “India Shining” days who are now weighing in with stories of markets being joined at the hip! Local stories do little to educate on what is happening and is going to happen (!) in our local markets. Most local commentators worth their salt correctly look to charts of the SPX, USD, credit in the US etc. as reliable portends of the shape of things to come. The de-couplers of past were certainly wrong – they ignored the big glue that sticks us (and other emerging economies) together with the rest of the birds flying at the head of our skein. That glue, is undoubtedly the currency exchange rate. Take a look at the comparison of the NIFTY vs the DEFTY chart below. 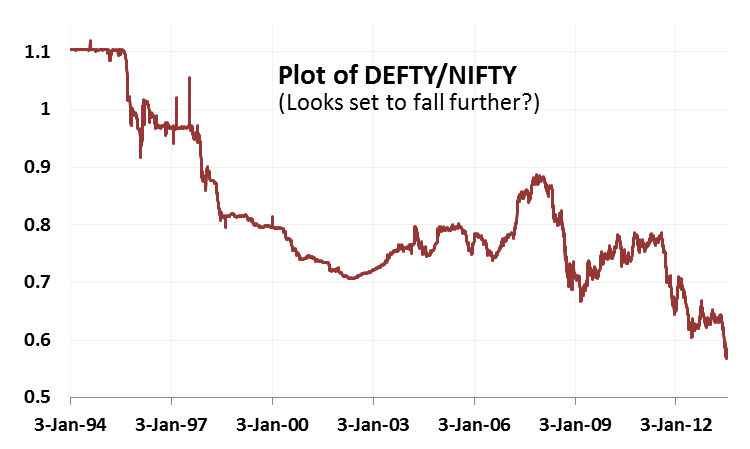 I have also charted the ratio of DEFTY over NIFTY – since 1994 each unit of NIFTY is getting you progressively lesser and lesser quantities of DEFTY, indicative of a massive squeeze on the INR. The human eye searches for patterns where there ought to be none! My untrained eye seems to suggest a great support at 3,000 on the DEFTY. We are ~3,350 currently, so a nice 10% correction would get us there. Possible? I don’t think any expert would be foolhardy enough to put a zero probability for that happening. So, either the INR rises in the immediate term or the market falls on disappointing results or both happen to get the DEFTY down to this level. But yes, as far as patterns and psychological levels of supports go, the 3k mark does provide a nice breather. So if you are trading, the USD:INR is obviously a huge factor to consider. 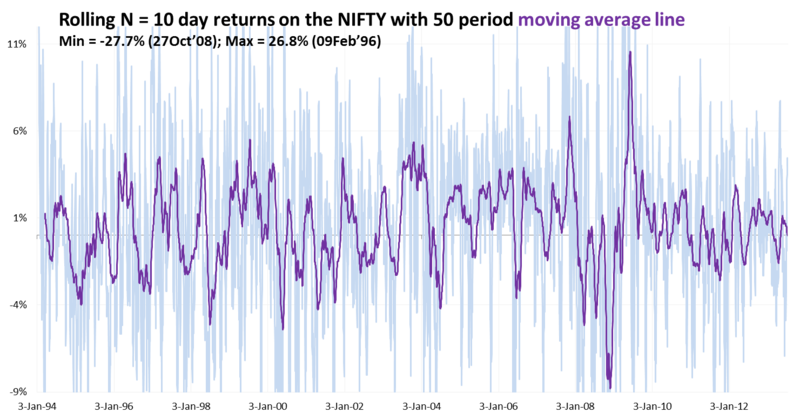 The graph on the right plots the correlations between N day returns (on a given day) and the immediately following Nth day return.  The blue line is for the NIFTY N day return correlations while the red line shows this relationship for the DEFTY. For positive value of correlation coefficients, one can expect that given a positive (negative) N day return, the next N day return will also be positive (negative) – i.e. 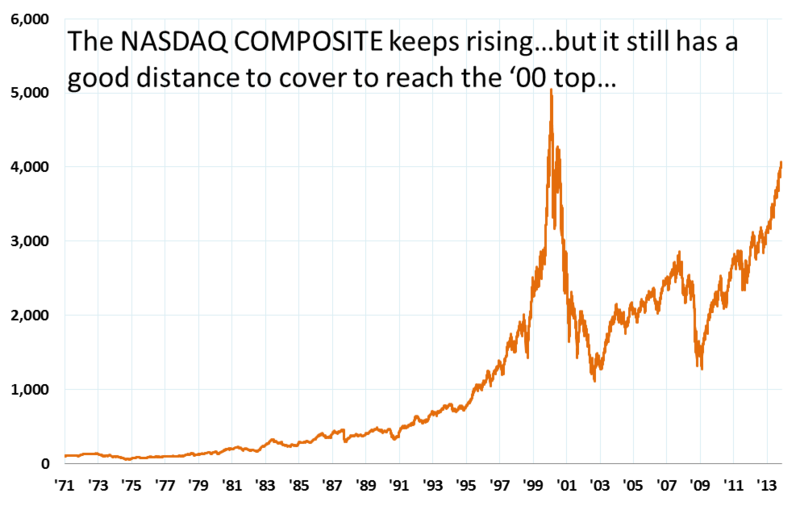 the tendency for the trend to continue. Both the NIFTY and DEFTY data suggests that this correlation peaks at N = 10, implying that given a 10 day trend, it is most likely that the following 10 day period will stay true to that trend. The point here is that from an overseas investor perspective, the relationship is more pronounced as compared to the internal view. NRIs are raking it all in!! Hopefully some of them will fill our reserves with their precious FCY and buy houses here. Please note – this is median behavior, the N day returns are likely to show a normal distribution with some really fat tails (9/11, bombing of Parliament, Lehman event, etc.). the chart below shows the rolling 10 day return on the NIFTY over time and its 50 period moving average line. The outliers (i.e. the fat tails of the N = 10 day return normal distribution curve) are as high at 26.8% on the positive side and as low as 27.7% on the negative side!! Shouldn’t trading be an Olympic sport? 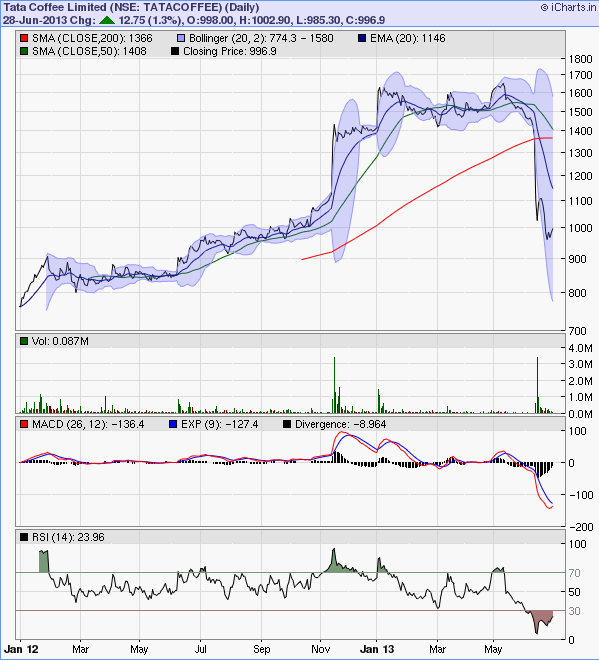 The other stock that I have been staring at for quite some time this weekend is that of Tata Coffee. I mean since when have better known counters started dislaying a pattern that looks like a square wave? remember all those electronic waveforms – saw tooth (quite common in Indian markets), sine wave (maybe long term commodity plays show this – haven’t checked) and now this square wave, like the 555 timer output waveform!! This Grand Canyonish stock chart also seems to suggest of brokerage firms triggering massive scale sell offs due to margin pressure on their client positions. It may not be related with the global price of coffee at all. Thinking if this is a cup to sip at all – not personally in the mood to do any research about the stock. – you may be aware of this, but I wasn’t. Kotak Mahindra Prime, one of the largest institutional investors into Tata Coffee sold a big deal as did one individual investor. – this again triggered some margin calls and ergo the price is now really lying low. – if it falls a little bit more – say 935 – 950, it might be a good position to take.